Let me just start by saying: furniture is expensive! And there is no shame in using hand-me-down or previously owned furniture in your home when you are starting out. BUT- one thing you should ask yourself is- does it work? The answer to that question is entirely dependent on what you are looking to get out of your space. For now, lets have a look at The Ugly Sofa. Its probably made of worn leather or patterned fabric, maybe you got it for $20 on Craigslist, maybe it was your dead great-aunt’s, or maybe you picked it up from the curb, or worse, maybe its a futon **shudder**. The good news is- you have something to sit on! The bad news is- it looks like crap. Consider yourself lucky if it has no rips, doesn’t smell like cat pee, and can stand multiple people sitting on it without caving in. There are a few strategies to make an Ugly Sofa work for you. Which option, or combination of options, you choose is entirely up to your preference and personal taste. Don’t get an actual slipcover those are pretty expensive. Think of things you may already have, or that you can get used/cheap: blanket, throw, large scarf, bed sheet, curtain, bedspread, etc. Make sure it is big enough to actually cover the monster and hang almost to the ground. 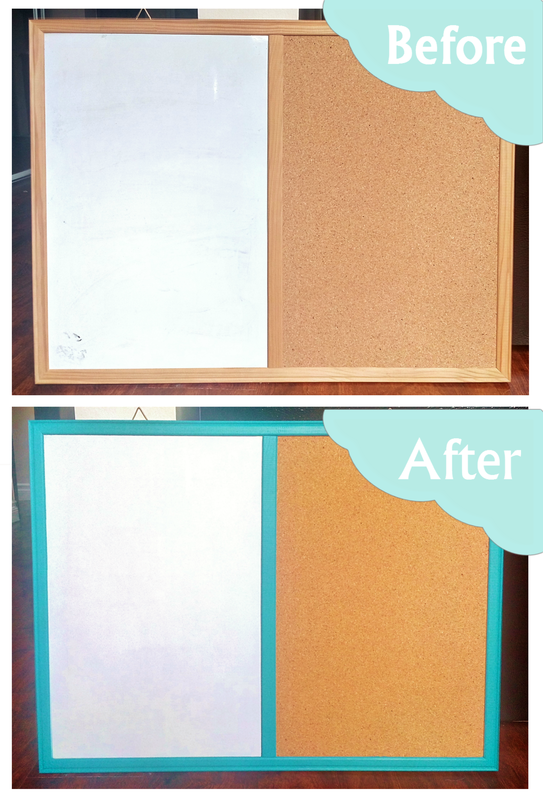 Patterns look best, as well as darker colors and textured materials, which take the focus off bumps and unevenness. Don’t have any of these options laying around? Visit your local thrift store to pick up something for a few dollars. Try and tuck in the edges and contour it around individual cushions for the most flattering end result. Now- its not going to look like all of a sudden your Ugly Sofa is a whole different color. But- for a quick fix, it cant be beat! 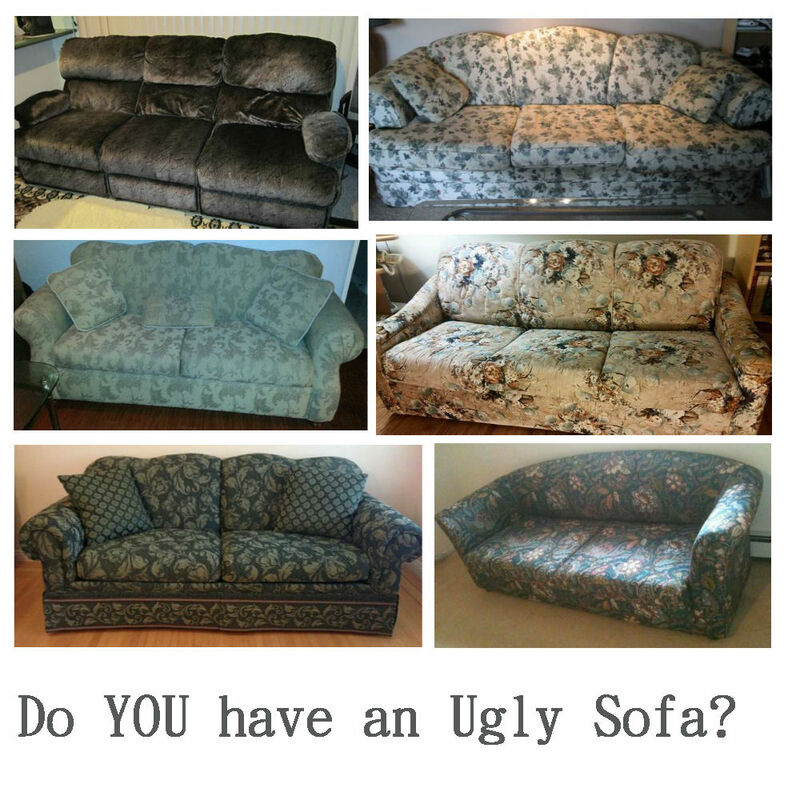 Lets say your Ugly Sofa is not actually that bad, and is actually in ok condition. Lucky you! In this case, a few ‘fluff’ pieces can bring it back from the dead. Think: cushions, pillows, throws, etc. Now- don’t go out and splurge on expensive throw-cushions that might not even work with your next sofa. 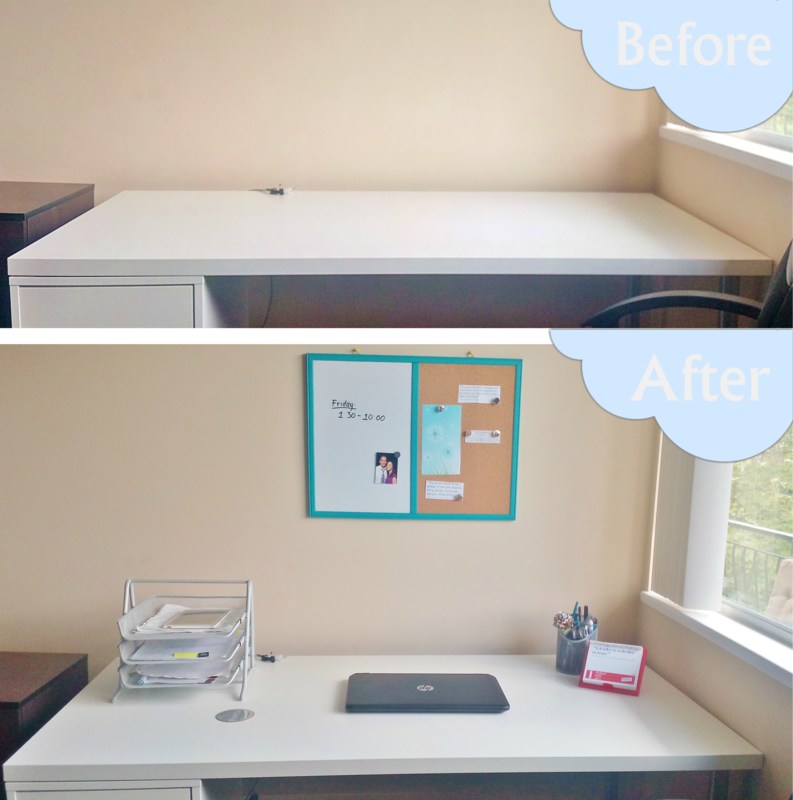 Instead, look for cushions in a standard size, that way covers can be changed with your mood. This part is fun- think about colors, patterns, and textures that you would never consider on a big scale, but that work in a small scale. My rule of thumb is no more than 2 pillows per sofa. 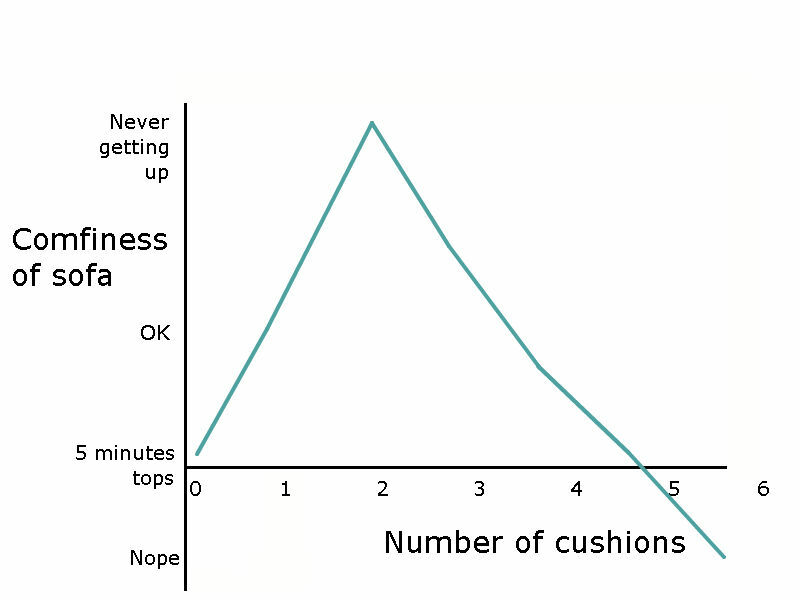 Please see the following comfy-graph to illustrate the relationship between number of cushions and comfiness of sofa. Now, this option only applies if your Ugly Sofa is more on the “ironically vintage” side of style. It could be a groovy 70’s floral print, a tweed that actually works with your walls and carpet, or leather that has that vibe of “I’m only worn out because rock bands used to chill on me in their rugged rehearsal studio”. Whatever it is, if you are actually not mad at it, let it inspire you. Maybe this is the jumping off point to define the whole tone of your room, or maybe it only takes one piece to pull it together to feel eclectic but cohesive. If it works for you, let it shine! Function: Do I use it mostly for TV watching? Entertaining? Reading? Will there be kids / pets involved? Does it need to be fort-able*? Does it need to have multi-functions ex. For sleepovers? Style: Do you prefer fabric or leather? Specific colors / patterns? Corner vs. Loveseat? Big puffy recliner or sleek and modern lounger? Budget: Can I get it used / second hand? Is there a lower cost alternative that can still meet my preferences above? *Fort-able= can the individual cushions be taken apart to make a pillow fort? Hopefully these tips help you re-think your Ugly Sofa, and spark your imagination for easy solutions. Lesson– don’t be ungrateful for hand-me-downs, even if they are an Ugly Sofa. Instead, be inspired to make them work for you! When we first moved out we got an Ikea futon with a denim slipcover as a hand-me-down from a generous neighbor. As grateful as we were for the additional seating, you can only imagine our excitement at the fact that it was a futon. And denim. So we set out to find solutions to make it work. I researched slipcovers online ($$$!) and then figured it would be easier to get a bedspread from Ikea to use as a cover (~$30), as it could be later re-used if we decide to switch it up. We got a dark brown one with textured stripes, and used some existing beige and brown silky pillows that came with a bedding set to fluff it up. It worked for about 2 years. Then we moved and decided to change it up, so we bought an actual slipcover for it (~$50) but dyed it grey, and used the same cushions, which still worked. That lasted about a year. We ended up replacing it with a much nicer sofa eventually, but for something that was free we sure got a good use out of it! Overall, we invested under $100 into that free sofa, and we made it work for us through 3 years and 2 apartments! Got an Ugly Sofa story to share? Leave it in the comments!